That's so awesome! I'm taking! AH! It's brilliant! I love it! I'ma put this on my user-page. LOL, awesome work! Will credit you. HAHAHAHHAHAHAHHA that's sooo funny! i love it! HAHAHA SO going in my info! thank youu! hi, i just stumbled upon this and i think it is highly awesome! how can i put it on my info, how do i credit this awesome work? See that little scrolly i frame thing? Copy all the code from that box and go here: http://www.livejournal.com/editinfo.bml and scroll down a bit till you see the heading ABOUT YOU. Paste the code into that box and then scroll down all the way to the bottom and hit "save changes" and then you're good to go! No need to credit because the link leads back to this post! That is just way too cool!! It's going in my userinfo pronto! :D Genius!! 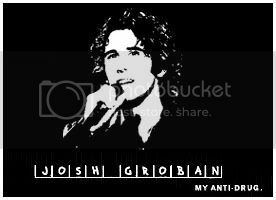 i LOVE Josh Groban!! wow, he is now my anti-drug!! thanks!! That's awesome! I'm taking it! Thank you!